This 1-2 minute serio-comedic monologue is spoken by an adult woman for theater auditions. Mrs. Tomlin, a middle-aged teacher, addresses a roomful of sullen students. All right, you little monsters, welcome to Detention. There is no talking in Detention. There is no gum-chewing in detention. 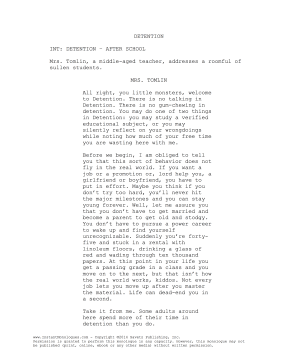 You may do one of two things in Detention: you may study a verified educational subject, or you may silently reflect on your wrongdoings while noting how much of your free time you are wasting here with me. Before we begin, I am obliged to tell you that this sort of behavior does not fly in the real world. If you want a job or a promotion or, lord help you, a girlfriend or boyfriend, you have to put in effort. Maybe you think if you don't try too hard, you'll never hit the major milestones and you can stay young forever. Well, let me assure you that you don't have to get married and become a parent to get old and stodgy. You don't have to pursue a power career to wake up and find yourself unrecognizable. Suddenly you're forty-five and stuck in a rental with linoleum floors, drinking a glass of red and wading through ten thousand papers. At this point in your life you get a passing grade in a class and you move on to the next, but that isn't how the real world works, kiddos. Not every job lets you move up after you master the material. Life can dead-end you in a second. Take it from me. Some adults around here spend more of their time in detention than you do.